Discussion in 'Downhill & Freeride' started by Edgy, Sep 2, 2005. With theses rediculous gas prices..I'm gonna have to ditch the shuttle vehicle for a small compact ie. Mini Couper. 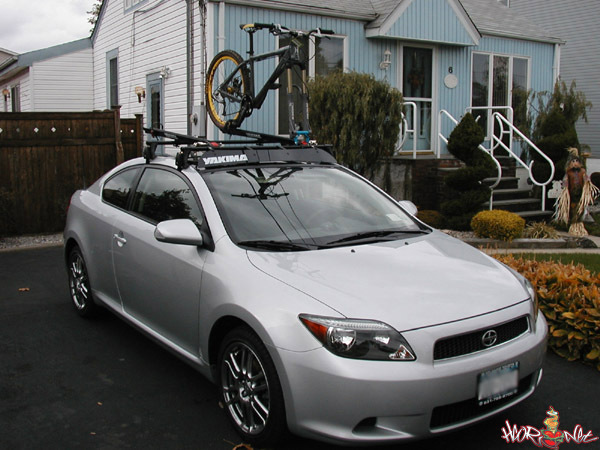 I see that Sportworks/Thule makes the type of roof rack where you don't have to remove wheels. Anybody have any insight with this type on a small compact...I mean my DHR probably weighs more than the car! I want to be able to get 2 DH bikes up there?? Do you mean the original Mini cooper? Not the new BMW one? If so i'de also be interested.. Edd and myself are trying to sort one for the top of his mini.. We're honestly not sure how two racelinks are gonna fit up there though! Dang!.....that is a MINI! No I'm considering the BMW Mini which from looking at your pic is probably a bit bigger...but yeah I'm wondering if that size of car can handle the weight of 2 bikes. not sure about the mini, thought that they have a 100lb weight limit or something on the roof. and if you get the MCS, you can't put a hitch on it either due to the center exhaust. 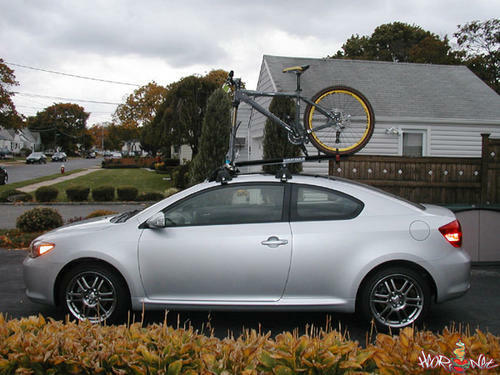 I've got a tC, and it does have a roof rack on it. cuts down on the mileage I get, w/o bikes I get 28 or so, w/ bikes it drops to 24-25 depending on the speed. fits 2 dh bikes fine, though. Will a hitch mount work? Well like Dante pointed out the Mini S has a dual exhaust right in the middle...so thats why I was inquiring about the roof method. I saw someone on the other side of the freeway with this type and it looked like they were in a small to midsize car. I have a new beetle. Even with a fork-up, 1 DH bike is pushing the limit of the roof rack. I've had it come off with snowboards before. The limiting factor on a small car is the 2 door issue. With no rear doors, you have to place the cross bars of the rack very close together. You don't have to be a physics major to know that wider is better for heavy leveraged loads. Good luck with a hitch rack on a car that low. If I could get a sportworks on my beetle, I would. you can prob do 2 dh bikes on the top of the mini, if they are like my VW or my dad bmw they have actual tabs that say a yakima clip will actually go around, the thing is incredibly stiff, and the mini is an engineering marvel, im sure i can withstand 100+ lbs. Personally though with dh bikes i would run fork-ups they are so tall that i just never feel secure having them wobble. My setup on my jetta right now is tight, its a regular yakima roofrack, with 2 viper attachments (the best yakima has) and fork ups for the DH bikes...my 2 cents. Thanks gents....all points well noted and it does seem that the fork up is going to be the safest method for compact cars. Of course I was trying to be a lazy azz and NOT have to pull the front tire off but I guess you have to give to get...and what I need to get is better gas mileage. I'm blowing $60-90 a week going back n forth to work and the occasional shuttle. Thats at least...1 new Maxxis or 2 Kendas! Good luck to all...especially if you're in an affected area. Please elaborate. Is there a way to attach a roof rack to a VW other than those cheesy feet that grab under the door trim?? Yeah, I've got the non-stick pads. That's why I lost the front cross bar in a sidewind. Word of caution, don't ever use those snowboard rack risers on small racks. With theses rediculous gas prices..I'm gonna have to ditch the shuttle vehicle for a small compact ie. Mini Couper.....be able to get 2 DH bikes up there?? Aren't you the one who always makes fun of Rabie's Miata? I am not familiar with the Mini, but could you fit 2 people, 2 dh bikes, and 2 sets of DH gear in it? You might need one of those Mini's from that 'Italian Job' movie. I just saw a new beetle w/ hitch rack at lunch today. That's the first one I've seen w/ one. Yeah...its gonna be tight but I need to conserve right now..I'll still consider the truck down the road. BTW, Sagit just got a new Tundra and he's been the shuttle weenie for the last 2 years...so I guess its my turn. This is the perfect rack, quick easy and no need to take wheels off. It is the Yakima King Cobra rack. We did over 50 000 miles with Dh bike on the roof with no problems whatsoever - except maybe bugs in the midwest. Hey......so good to see your up and about..well at least on the comp. Hope you're recovering as expected...hope to see you in socal sometime soon.